Commissioner Kristalina Georgieva, responsible for International Cooperation, Humanitarian Aid and Crisis Response, said the EU executive needed “more systematic” relations between groups of commissioners who have shared responsibility over certain dossiers. As the present Commission is nearing its term, political thinking projects the construction of the future EU executive as “clusters” of Commissioners organised into five, six or seven “clusters” of core competences regrouping three or four commissioners. France’s leading candidate for the European Commission, Pierre Moscovici recently pleaded for a “more political” Commission organised in “clusters”. EURACTIV asked Georgieva about her experience with the so-called “RELEX cluster”, or the External relations cluster. The “Relex cluster”, led by EU foreign affairs chief Catherine Ashton, comprises Development Commissioner Andris Piebalgs, Enlargement and Neighborhood policy Commissioner Štefan Füle and also Georgieva. Although the “Relex cluster” is not official, there have been several examples when it acted as a body within the wider team of commissioners. Georgieva said that some important decisions have indeed been adopted in this “cluster format”. She gave as an example the decisions on managing the Syrian crisis. Georgieva said that in July 2013, she had proposed that a Syria package of funding would include humanitarian aid, but also development aid and funding from the EU neighbourhood policy in a coordinated manner. On that occasion, Commission President José Manuel Barroso, Ashton, Piebalgs Füle and herself had taken the decision jointly. “I agree this needs to be more so in the future”, Georgieva said. Asked if there was a need of more official type of “clusters”, she said that to the contrary, she thought the Commission should instead adopt “a networking approach”, or a “more agile approach”. 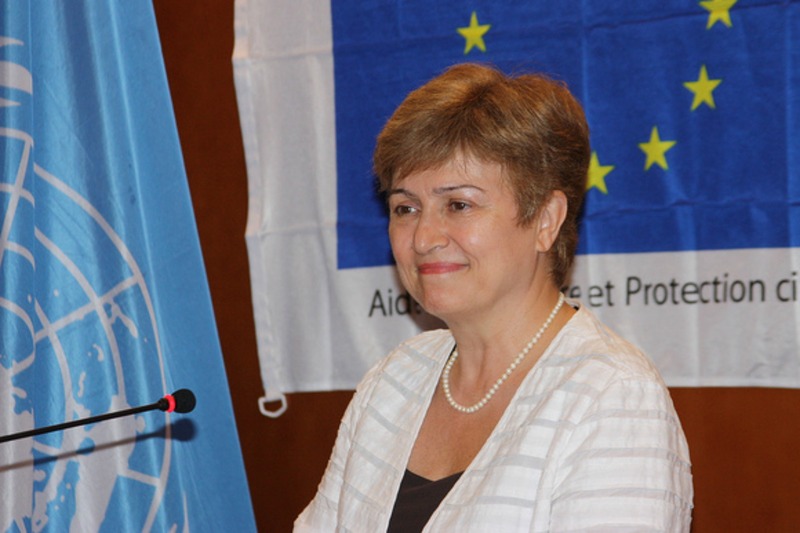 As an example, Georgieva said that in many cases, issues related to humanitarian aid or development the issue of climate change also needed to be discussed. If clusters are established in the future EU Commission, it is believed that the climate change commissioner should be part of a cluster comprising energy and possibly industry and internal market. In that sense, Georgieva called for “more systematic” relations between groups of commissioners who have shared responsibility over certain dossiers. This is good for bringing down barriers between different services of the Commission, and creating more horizontal cooperation, she argued. Georgieva said that the Commission needed to prioritise the “networking approach” also vis-à-vis its external partners. She gave as an example the preparations for the EU contribution to the so-called Hyogo framework for Action, a 10-year plan to make the world safer from natural hazards. An international framework for disaster risk reduction and resilience is expected to be decided at the World Conference on Disaster Risk Reduction to be held in Sendai, Japan in March 2015. Georgieva said that Margareta Wahlström, the Special Representative of the UN Secretary General for Disaster Risk Reduction, has been very impressed when the Commission brought together all Commissioners relevant for the preparation of the EU contribution – the climate change commissioner, the development commissioner, the regional funds commissioner, the budget commissioner and herself. Wahlström has reportedly said that this was the second time in her life when she saw a governmental-type of approach to deal with complex matters. The first time was reportedly in 2012 in Bangladesh, when the south Asian country embarked in a program of disaster risk reduction and climate change adaptation. Asked about her plans for the future, after her term as Commissioner would expire, she said she was concentrating on her present job. “When this moment comes, I will know, but for now I’m doing my job. I still have a couple of months in which at any moment there could be a crisis somewhere that would require us to act swiftly. Even here at home”, she said, referring to the forest fire season in Europe which is starting in summer. On the very day this interview took place, Georgieva left urgently for her home country Bulgaria who was hit by unprecedented floods in the cities of Varna and Dobritch [see photo gallery by Dnevnik, the EURACTIV partner in Bulgaria]. The Bulgarian government is near collapse and appears undecided whom to nominate as Commissioner. The most frequently cited possible candidate by the press is Sergei Stanishev, the leader of the Bulgarian Socialist Party and President of the Party of European Socialists. Stanishev has also been elected as MEP and needs to decide by tomorrow (24 June) whether he will take his seat. At a conference on Thursday (19 June), the EU Commission’s Director-General for Communications Networks, Content and Technology, Robert Madelin, commented on restructuring the EU executive’s efforts on Digital Europe. “The question is whether the Digital Agenda goes horizontal across all DGs and Commissioners,” he said. He remarked such a ‘horizontal approach’, as opposed to a vertical approach of one Commissioner and one DG – could enable the institution to implement digital economy incentives in various policy areas. Moreover, clustering the Commission’s portfolios could “break silo thinking”, Madelin said. The idea of clusterisation has fuelled debate in Brussels. Small countries are against grouping portfolios by theme, because they are worried about getting "junior commissioner" positions, while the bigger countries take over the more important portfolios. Reportedly, UK Prime Minister David Cameron has asked that the next British commissioner be given charge of a “cluster” of key portfolios comprising the internal market, competition, trade and energy.